*If you prefer, you can see a .pdf version here (2.38 Mb). Greetings from snowy Japan! Actually, the snow is all gone now, but earlier this month we had more snow in just two day than in the last 13+ years combined. Not only was the snow very beautiful, it was also amazing how quiet the city became. It was a nice change from the hustle and bustle of normal Japanese life. The teaching series on Kingdom Culture that we started last Fall is continuing strong. Each week we are investigating different aspects about life in the Kingdom of God. Recent topics have included Kingdom Culture as a culture of humility, a culture of forgiveness and a culture of prayer. Our desire during this series is that God would use the Word of God to renew our minds and transform our lives. Rather than conform to the "patterns of this world" (Romans 12:2), we want to actually walk in friendship with Jesus in a way that reflects the culture of God's Kingdom. We believe that this will not only bring renewal and transformation to the church, but will also empower each believer to be salt and light to the people God has placed in our lives. Please PRAY for each person at SIBC. May we have a growing desire to walk with Jesus and discover genuine life in the Kingdom of God. We have also recently made a few small changes to our weekly worship service. In a desire to give people more "free" time in the service to connect with God, we decreased the amount of time spent singing and have begun offering more time for quiet reflection and prayer (usually after the message). At first, the people didn't seem to know what to do during this time. They were so used to being told what to do during the worship service that it was a bit awkward when they were given the freedom to spend their own time with God. 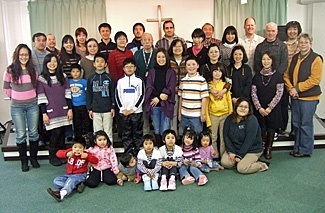 However, people are gradually learning how to use this time to come near to the Lord. Please PRAY that each person at SIBC would have a growing hunger to encounter the Lord and connect with Him each Sunday. At the end of last year (December 30th), we had our first ever wedding at SIBC. It also happened to be Michael's first time to officiate a wedding (in Japanese none-the-less!) Two long-time church members got married, so it was a great time of celebration for the entire church family. 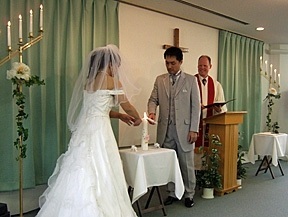 Please PRAY for Hiro & Miki Ueda as they start their new married life together. In our last newsletter we shared about Muneaki & Kayo, the young couple who found out they were pregnant just a few days before both of them were baptized. Well, in late January Kayo gave birth to a baby girl. Their daughter's name is Mana (named after manna in the Bible). According to Japanese custom, the mother usually doesn't bring the baby out into public during the first month, so we have yet to meet Mana, but we are looking forward to seeing her soon. Please continue to PRAY for Mana and her parents. We have recently seen two people make decisions to follow Jesus. The first was a woman named Takako Ueda (the mother of the groom). Her husband passed away in October 2009 (which happened to be Michael's first-ever funeral), but ever since then she began to open her heart to the Lord. Some of the church members had been sharing with her and she recently decided to believe. She is eager to grow in her new-found faith, but she often has to work on Sundays (she works in a supermarket). Please PRAY for Takako as she learns to walk with Jesus. The second person who has recently decided to believe was a young woman named Haruka. Fifi, one of our church members, and her friend shared Christ with Haruka one Sunday afternoon and Haruka said "yes" to the invitation to follow Jesus. Recently, Chris, Fifi and Haruka have begun meeting in order to study the Gospel of John together. Haruka has a strong desire to learn, so please PRAY for her spiritual growth. She is also currently preparing to get married in August. (In the photo, Haruka in on the far right and Fifi is next to her). The church is continuing to struggle in the area of finances. Next month will end the third straight year that we have finished the year in the red. If the situation does not change soon, we will have to seriously consider moving from our current location. Honestly, we are not very optimistic about this possibility because we are already in the cheapest place we could possibly find. The only way for us to save more money would either be to move to a smaller location or to rent a room only on Sundays. In many ways, neither of these is an ideal solution. Therefore, we ask that you please PRAY for the future of SIBC. We know that God has a plan for us, so now we want to clearly hear from Him. Last year Chris challenge herself by taking Level 3 of the Japanese Language Proficiency Test (there are 5 levels). She took the test in December and just last week her test results arrived in the mail. The good news is that she passed. Way to go Chris! Now it is Michael's turn as he is preparing to take the Level 3 in December of this year. We ask that you please PRAY for our language skills. This continues to be one of our biggest challenges in Japan as we are still far from being able to communicate freely in Japanese. Finally, since last fall Chris has been battling an infection of her inner eye (called Uveitis). It seemed to be all cleared up by Christmas, but it suddenly reappeared in January. Once again, is seems to be clearing up, but we ask that you please PRAY for complete healing from this condition. Thank you. Well, that is about it from our side. We hope that you are all doing well and are filled with the hope Jesus. Thanks again for your prayers and support.